Marquis has gained a swift response to the high-profile promotion of its Aquatic Training Vessel (ATV) with half of its hot tub retailer network in the UK signing up to get in the fast lane to swim spa sales. Following an extensive international exhibition tour; as part of a global launch schedule, including outings at the UK Pool & Spa Expo and SPATEX; the ATV has received a hot reception from the British trade and eight of the USA manufacturer’s 16 current UK-based dealers have signed up to display the innovative model in their showrooms. Welsh Hot Tubs Managing Director Steve Baxter has become one of the first dealers to take on and promote the ATV, which made a big impact at the International Pool Spa Patio Expo in Florida before its European debut in Lyon at Piscine Global. It has also had an appearance at The Pool & Spa Show in Atlantic City sandwiched between the two UK exhibitions at the Birmingham NEC and Ricoh Arena in Coventry. 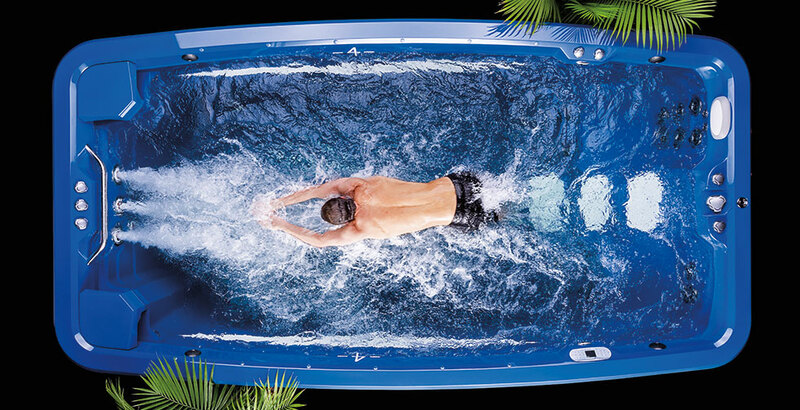 To help provide an extra promotional boost for the ATV, pictured, which comes in at 168.5” x 89.5” x 56”, Marquis is collaborating with six-time Ironman World Champion Dave Scott, the First Inductee to the Ironman Hall of Fame, to provide online exercise guidance with a dedicated SwimSpa Training section on its website. Marquis Director of Global Sales Steve Hasenmueller has welcomed the impact that the ATV has made with UK dealers and international trade audiences at the five high-profile exhibitions. During the UK Pool & Spa Expo he donned his swimming trunks and put the ATV through its paces with a full demonstration of water training routines that can be performed by all age groups, including swimming and rowing. “We’ve had a tremendous response to our launch of the ATV,” said Steve. “We’re obviously delighted with the success it has achieved at exhibitions in the USA and Europe. “Following our appearances at the UK Pool & Spa Expo and SPATEX the ATV has made a significant impact with our British retailers and eight dealerships have already signed up to supply it in their showrooms. Steve, who has been instrumental in building up the UK dealer network for the brand, has reported that he will now be relocating to Lyon to help Marquis enhance its French and European network operations. Newly appointed UK Account Executive Matt Roberts will now be continuing to liaise with current retailers and help launch additional Marquis dealerships as part of his role that he adopted before Christmas. 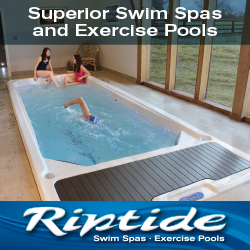 “We’ve got a great set of dealers and during our appearances at the UK Pool & Spa Expo and SPATEX we’ve managed to sign up additional dealerships for this year,” said Matt. “So I’ll be helping the new dealers get up and running, while also assisting with any showroom promotional activities involved in the ATV roll out.